Water is life, but when it comes to architecture, water is often death. Window condensation is often the culprit of decay and rot. It’s impossible to avoid condensation altogether, but it is possible to lessen the damage. There are two common rating systems for assessing the ability of a window to resist condensation: Condensation Resistance Factor (CRF) and Condensation Resistance (CR). The American Architectural Manufacturers Association (AAMA) originally developed CRF, which is determined by measurement of frame and glass temperature under defined test conditions. The CRF value is calculated by using the lower of the weighted average of the frame temperatures or the average glazing temperature. The higher the value, the better the condensation resistance, with values usually falling between 30 to 80. NFRC developed CR, which is generally a calculated value. CR can be optionally reported on an NFRC rating label. On a scale of 1 to 100, the higher numbers represent higher resistance to condensation. Both CRF and CR only provide relative comparisons of the condensation performance between windows, not absolute values. The two systems are not correlated, so comparisons cannot be made between the two rating systems to assess relative product performance. While you can find fans and critics of both systems, these tools are widely available and used in our industry. That being said, the NFRC is currently considering a revision to refine the CR methodology. A valid question arises as to whether there is a direct or linear correlation between either of these condensation resistance metrics and window U-factor. The answer is no. That’s because condensation formation is driven primarily by thermal bridging at the frame and edge of glass (EOG), whereas the U-factor is a weighted average of the thermal transmittance of the whole window. For example, a window with a poor frame and EOG with a very good center of glass (COG) could achieve the same U-factor as one with a thermally broken frame, good EOG and average COG performance, yet the condensation resistance of the window with the better frame and EOG thermal performance will have a better condensation resistance. 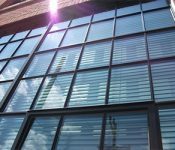 The increased use of fourth surface low-E coatings also illustrated the poor correlation; while using them reduces window U-factor, the resulting condensation resistance is worse since the inside surface temperature of the glass is reduced. Some buildings require higher levels of humidity, such as in hospitals and laboratories. 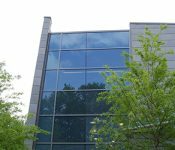 To assess the fenestration performance needed for outdoor temperature and interior humidity conditions, AAMA created an online calculation tool that helps determine an appropriate CRF specification for specific project needs. Another positive impact of reducing overall window U-factors and improving condensation resistance is the improvement in occupant thermal comfort. Thermal comfort is a significant issue in buildings and is directly impacted by building envelope design. These issues impact the productivity of employees and effective use of floor space. Effectively improving the resistance to condensation in fenestration system design starts with overcoming thermal bridging at the perimeter of the window. Frames that have very good thermal properties can allow EOG solutions with a warm-edge spacer to make a significant contribution to overall window U-factors. This also results in significant improvements to condensation resistance. Optimizing glazing system design for improved condensation resistance works by focusing on the frame perimeter and EOG first. In doing so, improvements in the center-of-glass performance can have more impact on the overall window performance. Taking steps to reduce damage from condensation can save you money in the long run. Request a quote to see how we can help you find the best windows for your needs. Products manufactured by St. Cloud Window are designed and engineered to perform at the top of their class. Products are continuously tested to the most up-to-date architectural performance standards by certified and accredited testing laboratories, in accordance with uniform US and North American protocols. Get in touch to learn more about any of our high-performance window products.